Nothing formal — a group of friends played a leisurely, good-natured game on a seriously foreshortened backyard diamond after a meeting. It was practice for my 40th high school reunion in August, when 42 of us who grew up together are going to play softball in Tacoma’s Cheney Stadium–home of the Tacoma Rainiers (the Seattle Mariners’ AAA team). This may not seem like a big deal to you. 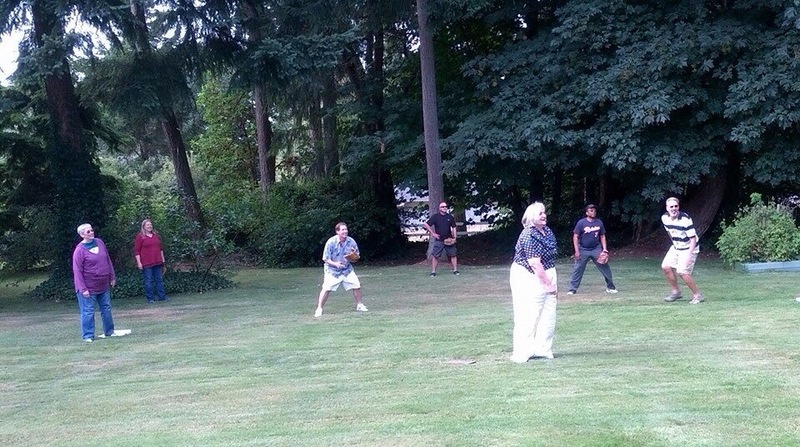 People play casual softball at family gatherings and summer picnics all the time. So what? Well, it’s a milestone for me. You see, my body is different now. Yes, I’m two decades older and considerably softer than the last time I hefted a bat. But the real difference is not immediately visible: cancer treatment changed how my body performs. I was a tomboy, relatively athletic for a girl growing up in the 60s. I could run and jump and throw, and I was pretty fast. As a kid I played sandlot ball with the boys because I “didn’t throw like a girl.” I played softball most every summer after I turned ten. I played the available intramural school sports and lettered in track in the first year it was open to girls. In college, I continued playing intramural sports and spent a year on the women’s club softball team. After graduation, I joined a Masters swim team and hiked with The Mountaineers. Later I ran 5Ks, rode my bike for miles, and played adult slow pitch for several years. I wasn’t truly a “jock,” but I knew how to move. As I aged, I moved less, and would occasionally allow myself to get sedentary and out of shape, but in a bout of remorse I would get myself back into shape again. I was fit and healthy when I got diagnosed with lung cancer in 2011. Now? Chemotherapy left me with peripheral neuropathy that occasionally interferes with walking and balance—my feet can’t sense the ground reliably. Radiation to my chest caused scarring and volume reduction in my lungs, so my oxygen level drops when I walk at a modest pace. Radiation to my right collarbone area hit a main nerve bundle, which causes some weakness in my right arm and a risk of damage if I lift too much weight with it. A year of steroids packed on the fat while decreasing my muscle tone. My current targeted therapy causes edema in my legs and hands that affects their movement and comfort. Some combination of side effects keeps my red blood cell count just below normal, which saps my stamina and ability to move quickly. I do exercise regularly on the treadmill and elliptical, but I can’t yet get the pace anywhere close to a brisk walk for more than 30 seconds without breathing fast and hard. I’m not complaining, mind you–I’m happy to be alive and have a relatively normal life on my current targeted therapy. But I must face reality: the body I have now is not the same one I had Before Cancer. That’s why that low-key softball game was such a revelation for me. The moment I put the glove on my left hand, my body recalled those days on the softball diamond. After some initial fumbles, I caught the ball easily when it was thrown to me. After a few gentle tosses, I could throw the ball to another and actually hit their glove. After couple of wimpy at-bats, I connected with the ball. And when I ran to first base, I moved faster than a walk. I’m not exactly sure what to call that gait (it wasn’t running, it wasn’t jogging, and it certainly wasn’t graceful), but I got to first base before the ball did, probably due to the good graces of the fielders—thanks, guys, I love you. For about twenty minutes, I was a softball player again. When the next batter hit the ball, I just barely made it to second base, but I was safe. I stood tall with both feet on the bag, reveling in my accomplishment as I gasped for air. And it occurred to me that maybe, just maybe, regular training could get me to second base in August without breathing quite so hard. I had been thinking I would only pitch during the game and let others do the batting and running. But maybe I COULD bat, and “run” too–especially since the game rules allow players up to five minutes to get to first base (note to future reunion attendees: Reunion Committee members get to write the rules). After crossing home plate, I excused myself from the game and sat down to catch my breath. My friends played on. I resolved that I would be on that field in Cheney Stadium as long as my breath and body held out. I WILL get beyond first base in August. I know there’s no stealing in softball, but to steal a James Bond phrase: there’s no point in living if you can’t feel alive. This entry was posted in Lung Cancer, Side Effects, The Bright Side and tagged 40th HS Reunion, exercise, friends, softball. Bookmark the permalink. Wonderful! I love it ! I recently played kickball at vacation bible school at our church with the kids and other adult helpers and felt giddy while running to each base and stealing an extra base occasionally. I wasn’t athletic like you when I was younger but loved the feeling of running and playing again! What a triumph! I can identify due to different physical limitations (RA and DJD). I loved softball and also played on an adult team for years. It’s so inspirational to read how you’re not letting cancer keep you from living as fully as possible. Keep on keepin’ on! Wonderful post, Janet! My body also has been changed due to health challenges, so this was both inspiring and nostalgic for me. Thank you for your honesty and clarity. Can’t wait to see you and the rest of your courageous/fun team in the Class of ’72 game at Cheney!